Want to convert videos among regular formats like MP4, MOV, AVI, WMV, MKV, FLV, 3GP, VOB and more to fit your individual multimedia devices? These guides lead you through the editing and converting process from video to video and video to audio. Yeah, it's a world of entertainment now and video plays the most important role there. 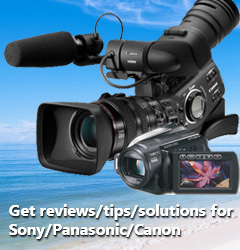 This Video Solution section shares great tips and tricks to help you freely enjoy your video anywhere and anytime. The page will offers ultimate workflows to play, edit, convert and share 4K Ultra HD videos in Windows/Mac. This page will offers all-round solutions play, edit, and convert MKV video files in Windows/Mac. This page offers several simple methods for you to play, convert, edit, etc. MP4 files as well as an ultimate solution to handle MP4 videos. Facing problems for editing or playing VOB files? Here you will find easy solutions to convert VOB files to various formats for different use. This article tells you how to play, convert, edit, burn AVI files in a hassle free manner. Still wondering how to play and edit MPG/MPEG files on different platform? Read this article to find out the quick solutions. Converting MPG/MPEG is easy as ABC. In this page, you will get different solution to convert, transfer, play, edit, and burn TiVo files with ease.